This is one gull that really fits the informal term seagull. The red-legged kittiwake (Rissa brevirostris) nests on island cliffs up to 900 feet high and then heads off to sea during the winter months. The bird is similar to its more common cousin, the black-legged kittiwake, except for the leg color, a shorter and more curved bill, a larger, rounder head, and darker gray wings. Red-legged kittiwakes feed mainly on small fish found in surface waters (especially lampfish and pollock), squid, and marine zooplankton. 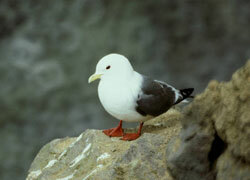 They sometimes form large feedings groups, called melees, with black-legged kittiwakes. Nesting on cliff ledges and rocky points between June and September, the red-legged kittwakes’ breed at only four locations in the Bering Sea: in the Pribilof Islands (the St. George colony contains over 80% of the world’s population of red-legged kittiwakes), Buldir and Bogoslof islands in the Aleutian chain, and Russia's Commander Islands. The bird is classified as vulnerable because of its limited population and range. Attu – fairly regular here.